It has been a rugged season for Santa Barbara’s high school football teams, and it could become brutally so Friday night (Oct. 16) for the San Marcos Royals and Bishop Diego Cardinals. They will face a pair of Southern California juggernauts-the Royals hosting the St. Bonaventure Seraphs, and the Cardinals travelling to Westlake to take on the Oaks Christian Lions. These could be called “David versus Goliath” games; but, in each instance, Goliath is likely to grab David’s slingshot and wrap it around his neck. I do not have to wonder what Scott O’Leary would have thought about the extreme enhancement of the football teams-putting them way out of whack with their fellow league members-at those two Ventura County schools. 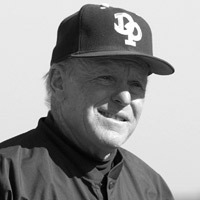 During his 34 years as a coach and athletic director at Dos Pueblos High, O’Leary was committed to integrity and fairness in high school athletics. He was concerned that every prep athlete had a worthwhile experience, one that led neither to disillusionment nor arrogance. He once told me: “The worst scenario is to lose all the games, or win all the games.” He decried the polls that tempted coaches to run up scores and the hyping of individual athletes. Swanitz spoke those words at a small ceremony in the DP auditorium last Friday, which was designated Scott O’Leary Day in the City of Goleta. A gathering of the late coach’s family and friends, including his widow Kathy, proceeded to the entrance of the on-campus stadium, where they unveiled a plaque that proclaimed it would forever be his house: Scott O’Leary Stadium. The dedication was low-key, a fitting testament to O’Leary, who was never much for hoopla and would not have wanted to distract attention from the football game that followed an hour later. There was, of course, an announcement: “For the first time, ladies and gentlemen, welcome to Scott O’Leary Stadium.” A vintage P-51 Mustang fighter plane, piloted by DP fan Jeff Pryor, made a sudden pass overhead. Performing the pregame coin toss was Roarke O’Leary, Scott’s son. WHERE HAVE YOU GONE, JOE DIPOALO? An All-CIF linebacker at San Marcos High in 1979, Joe has gone to Ventura, and his son Giovanni is a 6’5″, 255-pound senior lineman at St. Bonaventure. The younger DiPoalo, who has committed to USC, will play against his father’s alma mater Friday night. Giovanni was a little tyke the last time the Seraphs lost a league game, 14 years ago. REVERSAL OF FORTUNE: The L.A. Angels’ late-inning rally at the Boston Red Sox was not the only Houdini-like team performance last weekend. After trailing Cal Poly 8-3 in the decisive fifth game of their volleyball match, UCSB’s women rattled off eight straight points and went on to tame the Mustangs: 25-21, 24-26, 24-26, 25-20, and 15-12. It was the Gauchos’ first victory over Cal Poly since 2005, ending a string of six consecutive defeats-a brief slide in Kathy Gregory’s 35-year career as their coach. You can catch the Gaucho women at the Thunderdome in two pivotal Big West matches this weekend: Friday against U of Pacific and Saturday against UC Davis. First serve’s at 7 p.m.
KICKBALL: The Cosmic Banditos had the best showing by a Santa Barbara team in the World Adult Kickball Association Founders Cup tournament in Las Vegas. They went 2-1 in pool play, then lost to Arizona’s Straight to the Bank 4-1 in an elimination round. The Royal Tennenballs and Multiple Scoregasms both went 1-2 in pool play.